Traditionally, people put great effort into preparing for New Year's day, turning the house upside down cleaning it, and cooking special cuisine called osechi days before the turn of the year. Family members and relatives, as well as friends and acquaintances, gather for the occasion and exchange New Year's greetings. Or at least that's the way things used to be. When I was a child, every year around New Year, relatives and acquaintances would always come to visit for New Year's greetings. It was unusually busy and was a special day with a true New Year's feeling. Osechi was also full of stuff that you would see only at New Year. even osechi is made up entirely of ingredients that one sees everywhere, all year round. I saw two young elementary schoolkids and a person who seemed to be their dad or grandpa flying a kite across the farm road. These two kids were trying hard to fly a hand-made kite and I found it very cute. Rather than travelling to a distant place, spending the New Years holidays flying a kite on a rice field path in the countryside is also nice, I thought [to myself]. 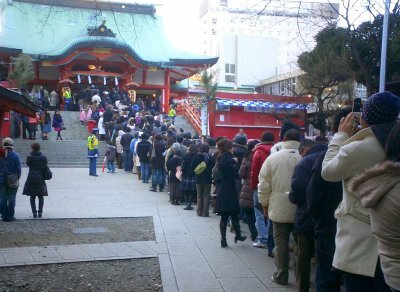 By the way, I recently found out out that Hatsumode, a custom in which people go to a shrine and pray at New Year's, is not an old Japanese traditional event, but was started by some railway company in the Meiji period. It's like St. Valentine's Day. Knowing that, I've decided to simplify my Hatsumode from this year on. I've decided only to go to Azuma Shrine. Come to think of it, Hatsumode is not mentioned in either stories from the Edo period nor in ukiyoe. What a smart railway company employee.